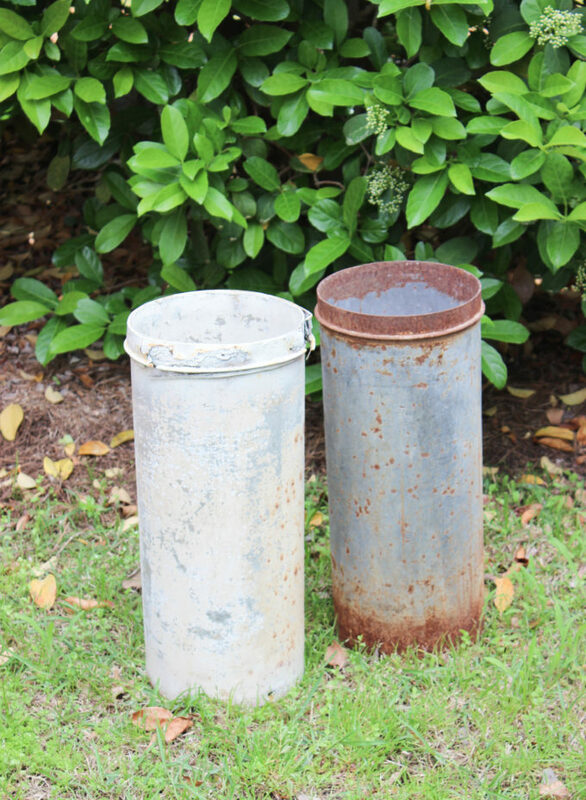 I found these rusty old dairy containers at antique barn in Charleston, South Carolina. These will make unique containers gardening ideas. I love how they have aged. The shabbiness is very charming. As much as I love painting, there is no need to paint them because they are beautiful the way they are. Once I saw them I knew they would make unusual garden planters. 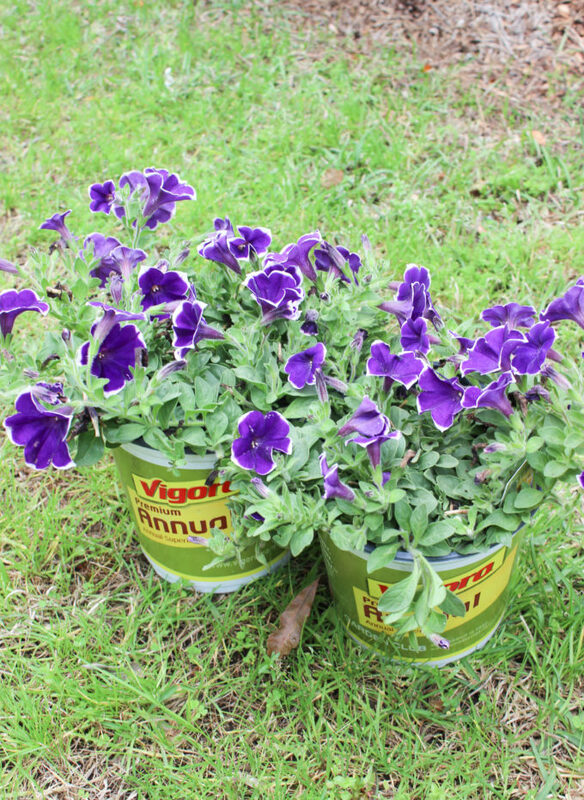 You don’t have to be an expert gardener to use these containers. I am not the best gardener, but I try to keep it simple. So this project is really easy all you need is potting soil, some plants and you are ready to go. Container gardening like this is so much fun. The possibilities are endless on what you can plant for all the seasons. For flower-pot ideas these containers are tall so I filled the bottom with rocks and the rest with potting soil so the flowers could grow and hang from the edge of the container. These purple petunias are gorgeous! 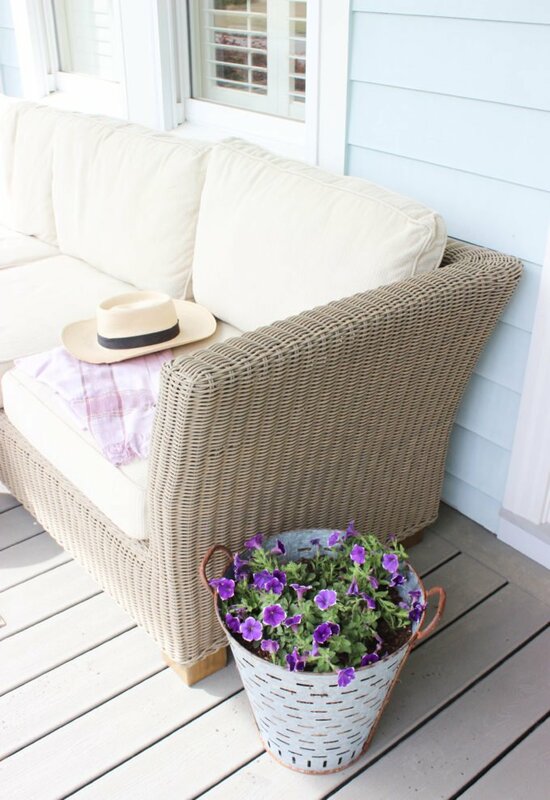 I love petunias because they come in all different colors and make great flower-pot ideas. These annuals will last until after summer. After that I can plant another annual that is perfect for colder weather. 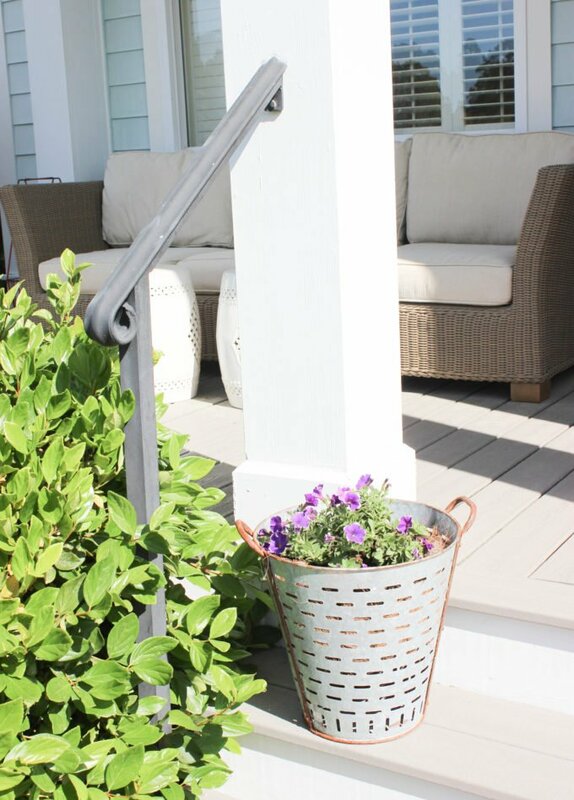 Another outdoor planter ideas that I am thinking of doing for the fall is adding lots of ivy then add flowers over that. Eventually the plant will gracefully creep spilling over the sides. I did not add the ivy this time around because the weather is getting warmer and the ivy will not do well in this climate, but it will do great for the fall. 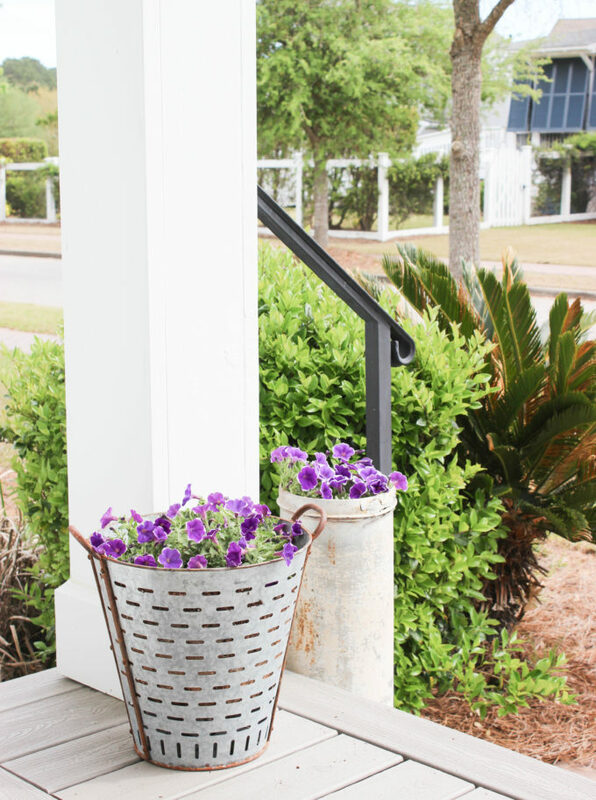 This unique container is another farmhouse style pail. I wonder what they used this for on a farm. Maybe eggs? 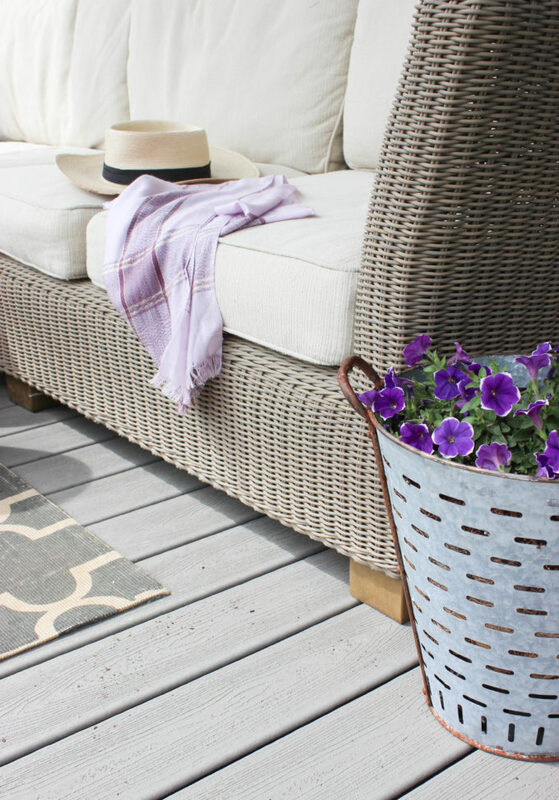 Shop unique container gardening ideas ! These are all great ideas. I will need to start looking for some unique containers as they do add charm to the garden. Thats true Debra. I wish I used them sooner! That container with the slots in an olive bucket. Dunno If they were used for anything else, but a planter or vase would work at my house! Thats great to know about the olive bucket> I live in the southeast and I assume they are plentiful in California Region or Italy.Thanks for stopping by. Looking good Maria! They almost look like ice cream bucket liners, but whatever, they are sweet as planters! Love their rusty patina too. Thats the word I was trying to find Rusty Patina! So true. and thanks again. 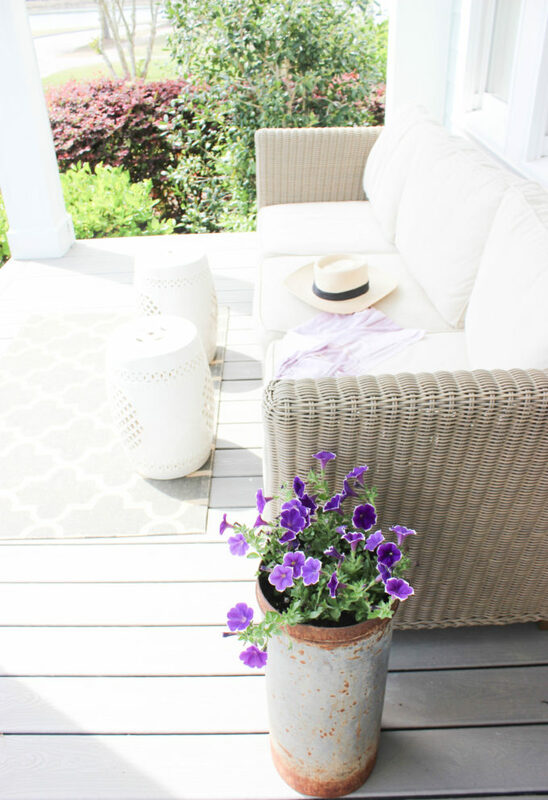 These look gorgeous Maria and your porch, just ahhh! I’m finding container planting to be fun this year. 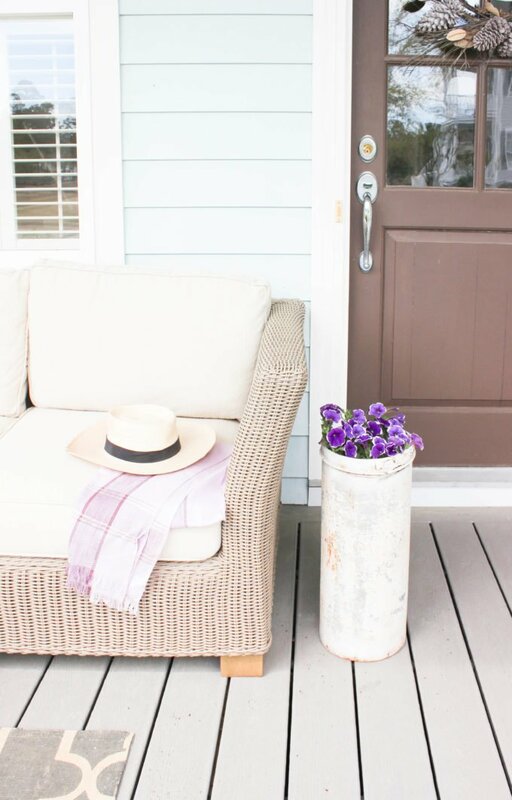 I love these vintage options they look so inviting on that front porch. Thanks Carol, hope you are well! Thanks so much for stopping by. I love using unusual items as containers for plants. Love how the two look together. They rust plays well together! Thanks Victoria, I love them together too!Have a great week! 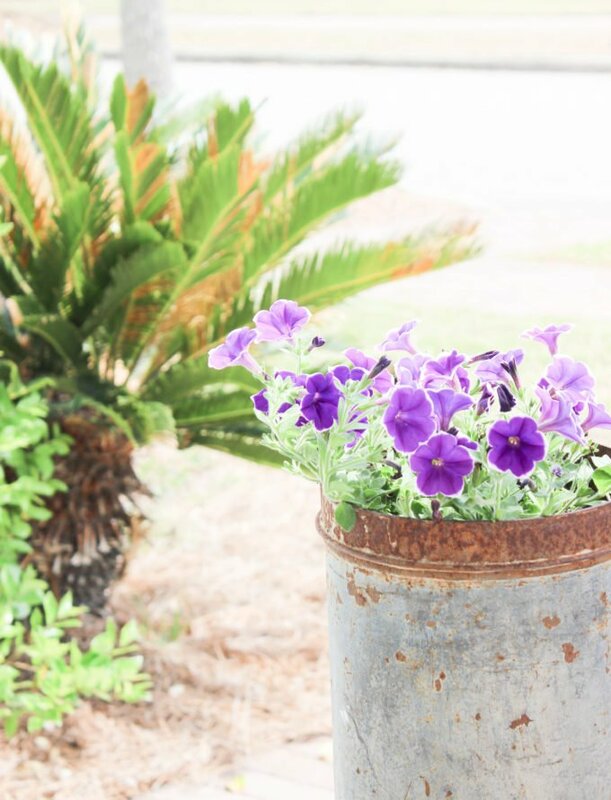 I love the old dairy containers, and the vintage olive bucket! They make great planters! 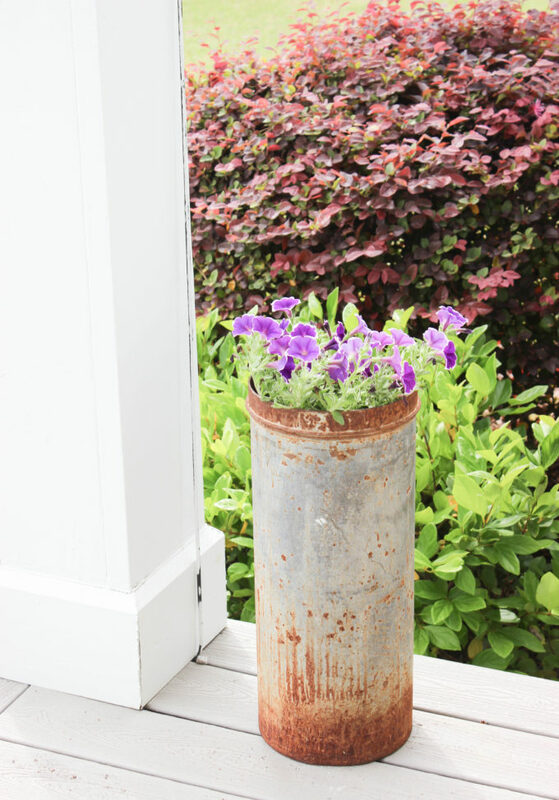 We are going junkin next week, and I hope that I can find some neat rusty old containers to use as planters. I hope you do! They are so versatile! Happy Junkin! oh this is fabulous! Love the olive buckets! I’ll be featuring you tomorrow as part of Thursday Favorite Things! Beautiful post! I am featuring you today at Thursday Favorite Things. Please do come over and link up again! So excited, your are so nice! Thanks so much! Thanks Amber! for featuring me what a treat! Love those containers!!! Super cute and love the flowers as well. Thanks for sharing on To Grandma’s House We Go! Your flowers look so lovely, the pots add to the character but I think your sense of design really adds to the charm. I am so excited that you enjoyed the post on my unique containers for plants. I love, love the containers! It is such a genius ide to use them and the flowers look prettier with them. Thanks for sharing at Fiesta Friday party! I hope you can pay a visit to other partygoers as well. Have fun! Hello Maria! What a neat idea! I think they turned out beautifully! 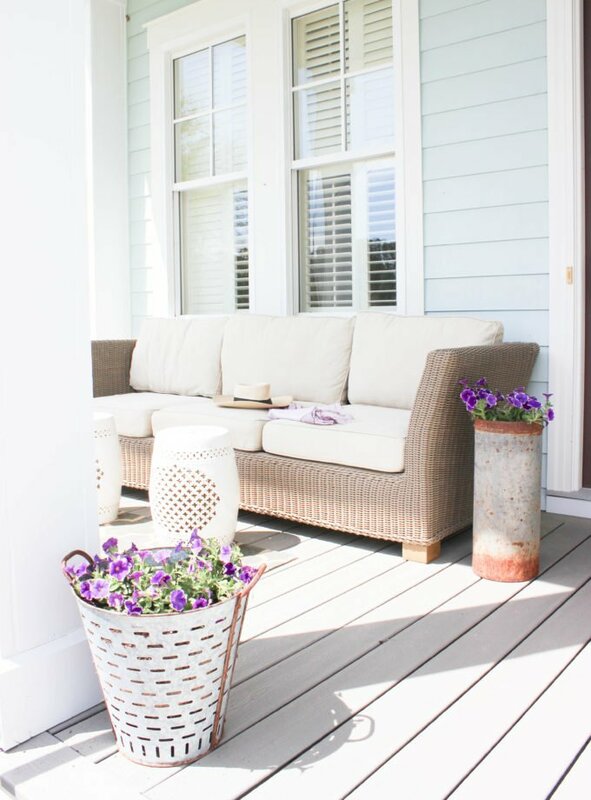 I am hoping to plant some flowers outside my home too this spring. Hope you are having a great weekend and thanks so much for sharing your with us at Full Plate Thursday! Thanks so much for stopping by! Love your parties. You are a girl after my own heat! I only use a few pots for garden containers. I love planting in unusual things. Yours are great! Thanks for sharing with SYC. I’m sure it’s not intentional, but I’m not seeing a link back party. Its been fun junking! Found some other items last weekend to make more plants DIYS, thanks again. Love your attention to detail. You found a real gem in those old dairy containers. Trash-to-treasure projects are the best. Thank so much! Glad you enjoy them. What gorgeous finds and love how you used them! Featuring when my party opens up tonight. Thanks so much for linking up!